Fare ye well, O Captain! My Captain! Imagine this. A Hollywood movie channel in India has been running Bicentennial Man all this month. From watching an android make clocks, I get into a discussion about what a man Robin Williams is. He can make even an android’s stainless steel face emote with his voice. Barely a week later, I wake up in the morning and scroll through Twitter for my daily dose of news. The first tweet shocks me enough. I think it is like one of those rumours that declared Morgan Freeman gone. I do a Google search, and it confirms my worst fear. What shocks me more? This chatterbox of a comic genius apparently succumbed to depression and committed suicide. Believe me, the death of a film legend has never had more impact on me. All I could think of was Williams’ infectious smile, that never really reached his eyes because it was stopped along the way by some deep sorrow in his heart. His childlike enthusiasm in his roles, his interviews or even during his stand-up routines made one laugh wholeheartedly. He was like that affable grandfather or an immensely witty uncle making jokes revealing little nuggets for wisdom all the time. Come to think of it, he was quite like my own grandfather. God! Their lips even curved the same way when they smiled! But that was never the reason I loved this goofball of a man. I was never much exposed to Hollywood. Williams as the fantastic nanny in Mrs. Doubtfire was my initiation into Hollywood. Also, that was the first time I could say without learning from others that our very own Chachi 420 was a rip-off of a Hollywood movie. 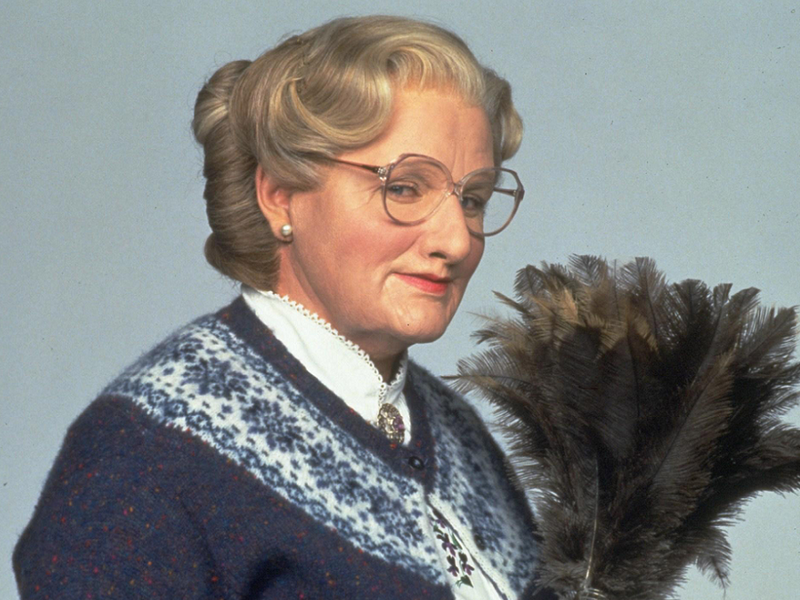 This father’s desperation to be close to his children was the sweetest thing I had seen, and I’d never have known sweet Scottish Mrs. Euphegenia Doubtfire was actually a man. I wanted to know a real Mrs. Doubtfire then. At least someone that kind, cuddly, intelligent, and interested in things like cooking and ballet. have Williams in it, I waited for him to come back into the frame. Be it non-stop jibber jabber, co-starring with CGI monsters, absent-mindedness, superlative madness or endorsing love and laughter as the best medicines in the world, he excelled in everything, and just how effortlessly. What a repertoire of voices and accents! What range of emotions in a single screenshot! And just how much warmth that man exuded! It was impossible not to want to hug him. He felt like family. Then there was that creepy side of his screen persona. As a probable murderer in Insomnia and a psychotic film developer in One Hour Photo. Or that more sombre everyday man we identified with in Good Will Hunting, Dead Poets Society, Awakenings or World’s Greatest Dad. Some of these were quirky characters, yes, but these were also people we see around us everyday. Sometimes we don’t even notice that we are these very people, hiding our quirks behind social sobriety. His critics may note that he held his own very comfortably in the presence of actors better known for their roles in dramas, like Al Pacino (Insomnia) and Robert De Niro (Awakenings). But most impressive about Robin Williams was the fact that you knew it was him, even when you couldn’t see him – like Genie in Aladdin, or Ramon and Lovelace in Happy Feet, or even Fender in Robots. You could sense his infectious energy. And even though you knew it was Williams giving character to the character, it was always new. It was always different. He was best left alone, with a skeletal script, and he worked like a magician every time. The physicality and tangibility that his voice provided to these screen icons was so remarkable, that they became your buddies. Genie will remain Genie, and Ramon and Lovelace will be known by their own names. For that, they will forever be grateful to Williams’ unsurpassed talent. There are so many things to say about all the times he made me laugh till I cried. Then there is so much to say about today how he almost made me cry again. There are so many who expressed how cheerful he made them and how he filled their childhood with joy I cannot thank him enough for filling my life with his happiness. I only hope he finds it wherever he has gone to.